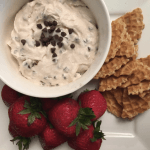 This so tasty, so easy creamy-sweet dip is a surefire hit for your next party, holiday gathering or picnic potluck. The deliciousness of everyone's favorite Italian dessert filling is perfect with fresh fruit and cookie dippers. Beat together ricotta, mascarpone, confectioner’s sugar, vanilla, spices, and zest in a large bowl using a hand or stand mixer until fluffy and well combined. (A food processor or immersion blender would work as well). Fold in chocolate and garnish with additional chocolate if you like. Serve with strawberries, graham crackers, or vanilla wafer cookies for dipping. This dip can easily be made a day or two ahead and kept chilled. Just bring it to room temperature and whisk briefly before serving.